This is a really big update for Ryver! We have introduced a new section in the Nav Bar called FORUMS. Forums are similar to teams, combining chat, posts and file organization. The primary difference with forums is that every member in your account can access all forums all the time. You can still add Guests to forums if you so choose. Teams remain invite-only, for when privacy is required. We have had a number of requests for allowing people to “browse” available teams and choose to join them. There also seemed to be a some confusion around our “Auto-join” option on teams. Forums is our answer to this customer feedback. In the long run, we feel this will be a much more clear way to distinguish “open” communication from “private” communication. We also feel that the word “Forums” is fitting for Ryver, as our POSTS tab will feel comfortable to people who are accustomed to traditional post-based forum software. Note: We added an All Hands forum, but did not remove the All Hands team for existing accounts. You might want to edit the All Hands team (from the PROFILE tab) and click the option to archive it, along with any other teams you think might make better forums. You can still access your archived teams via the drop-down in the blue bar of the TEAMS list view. Note: It may take a few days for Forum support to show up in our iOS client on the Apple App Store. We DO have an Apple TestFlight beta program if you would like to get your hands on the new build ASAP. Just email us at support@ryver.com. In the mean time, the current build up on the app store will still work with Teams and Users. You can now type ‘/’ into a chat textbox and see a bunch of quick text commands for performing common tasks, such as changing your availability or accessing your settings. One of the new ‘/’ commands is “/giphy <any word or phrase>”. 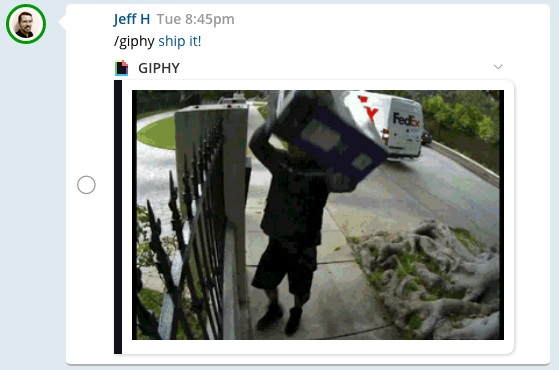 We have partnered with GIPHY.com to allow you to use this command to post an animated GIF into any chat room. Enjoy!